Using Human Hair Extensions is an easy way to update your look without having to wait months for your hair to grow long. 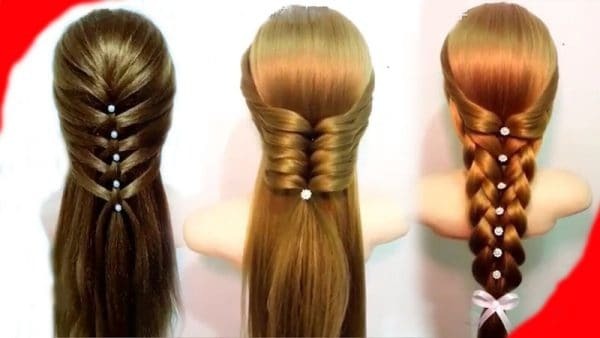 Hair extensions would not only add length to your hair but also provide you with many different hairstyles as well. This might sound easy to you but read this if you don’t want to ruin your thousand-dollar hair extension set with the over-styling!! Generally, you can ONLY use heated styling methods on 100% human hair extensions. Heated curling or straightening irons should never be used on synthetic hair. Because human hair is vulnerable to long-term heat damage, whether it is on a head or sewn onto a weft, a thermal styling treatment should be used to minimize damage before styling with hot tools. Most experts recommend curling or straightening clip in extensions when they are off the head. This can be done by anchoring the sewn end of the extensions under a heavy object; the extensions can either hang free off the edge of a countertop or lie flat on the counter and be lifted with the free hand. Style the extensions, let them cool, and then spritz with regular hairspray to finish. Sewn-in or glued-in extensions can be styled on the head though. Always do a test curl first and use the lowest effective temperature level (about 180 degrees). Overuse of curling irons, flat irons, and blow dryers will shorten the life of Human hair extensions. Also, try to use hair treatment any time you feel needed: Before heat styling, during heat styling or after heat styling hair extensions. 100% human hair extensions can dye. The perfect choice for coloring is the virgin hair extension – also called Virgin Remy hair extensions. Virgin Remy hair extensions directly collected from one head which has never been processed before, which is ideal for coloring. Dyeing hair extensions that are virgin will help the color appear more even and correct. Virgin Coloring hair extensions are much like doing them for natural hair and a lot of care must be taken to protect them from harsh chemical agents. Most other types of hair, especially synthetic hair, are unsuitable for dying as they tend to become really weak due to exposure to chemicals. Dyeing them will irreversibly damage your hair extensions. Again, strand testing is the best method to prevent damage from dying. Just like natural hair, once the hair extensions have been colored, do not try to tighten them again. That would only break the already damaged hairs and lead to an unwanted result. Toning them down is acceptable though. 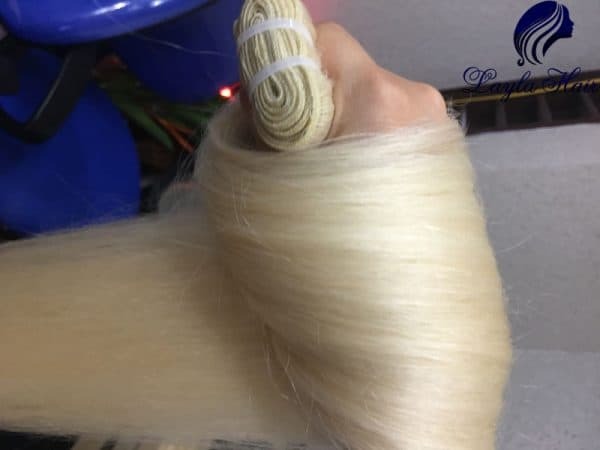 This also means that you can buy warm colored hair extensions and tone them down to cooler tone if you don’t want the suppliers to charge you more fees. Lightning is more difficult and riskier than darkening. Lightning usually requires bleaching hair extensions which can really damage them – even 100% human hair extensions. When being bleached, the hair extensions will become weaker, as the cuticles have been damaged after such a harsh process. Your bleached hair extensions then could not hold a curl or a wave texture for a long time anymore. They loosened after being washed right away. To avoid bleaching, you can directly dye the darker hair into the color you desire, but that usually leaves a tint of dark shade. The hair ends up with shades of slightly orange and brassy tone. However, re-doing the coloring over and over again should remove the orange shade and eventually get you to the light color that you had wanted. Usually, you’ll need three processes to obtain the perfect match. Colorings will have to be repeated in intervals of a few days. Also, if you are trying to bleach your black hair extensions but the bleach does not seem to work. Then it means your hair extensions gone through a lot of processes before they are on your hands. The process might also include dying black – which prevents you from lightening your hair. My only suggestion to that is careful when choosing a hair vendor – even if they say their hair is Remy, double check it by having a look at the prices and how long have they been in the business. Often, authentic Remy hair would have really high prices and have low to medium luster. The expectancy of the business also tells if their credibility is high or not. 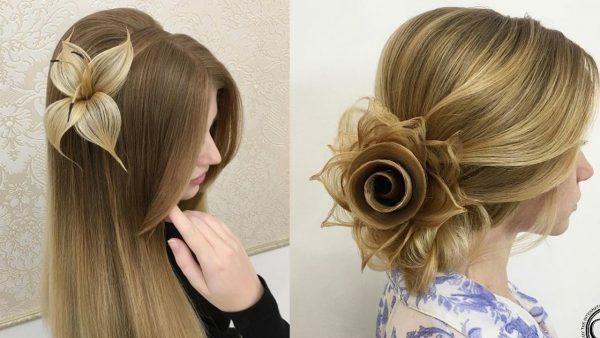 In the end, it is not easy at all to style your hair extensions properly. However, do follow the rules so that your human hair extensions can last longer and live up to the amount of money you wasted. Good luck beauties! !